A couple of months ago I reviewed a 3-track sampler from New Jersy's Redliner (read the full review here). The songs were meant as a preview of the band's upcoming debut album Vengeance, and in my review I stated that the promo hinted at a solid full-length release. Vengeance has arrived, and while the three songs on the promo rank among the top tracks on the long-player, there are still highlights aplenty. Everything about the promo holds true on Vengeance. The album bristles with classic hard rock references, from the big Mötley Crüe-like riffs on "Lay A Finger" to the Saxon-esque patriotic anthem "One Nation". As on the promo, "Never Got A Chance" remains the best song on the release thanks to frontman Jim Santora's heartfelt vocal performance and Dan Chrzan's melodic riffs. This particular track brings to mind The Offspring (think "Heaven Is So Far Away"), lending a contemporary shade to Redliner's brand of hard rock. As memorable as that song is, the most powerful track on Vengeance is "Tortured". Chrzan's heavily distorted main riff is rife with menace, lending a definite Danzig sound to the song. Santora's performance, as well as the rumbling tempo and Chrzan's slightly chaotic solo, further amplifies the morbid tone. While hints of Redliner's hard rock influences abound on Vengeance, the album is nevertheless a distinctive blend of modern and classic elements. The songs are fresh, yet have significant familiarity to them which allows the band to reach a broad range of listeners. 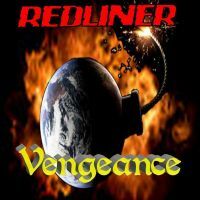 Redliner may well be just one band in the legions of hard rock hopefuls, but they possess not only the chops but the edginess to work their way to the front of the pack. Keep an eye on these guys.